Reading The Game: The Long Dark : All Tech Considered Our occasional series on storytelling in video games returns with a look at the survival simulator The Long Dark, which uses sound and silence to build a world not long into some terrible disaster. 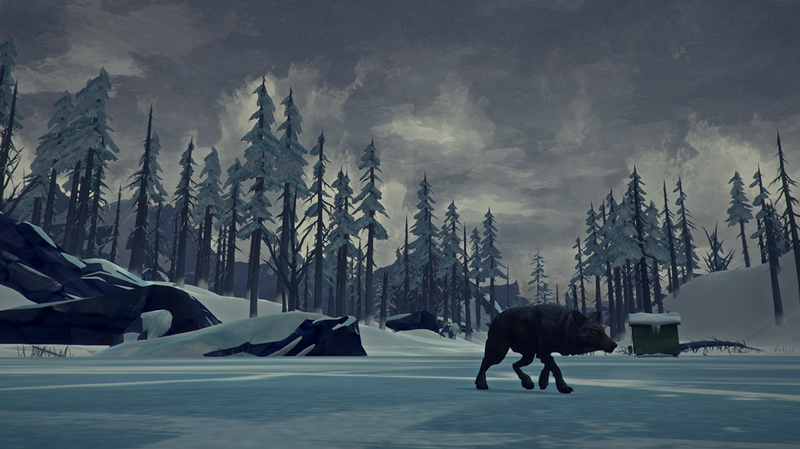 Someone — either this wolf or you — is about to meet an unfortunate end in the survival simulator The Long Dark. I love the quiet of The Long Dark — the essential, soft and rounded naturalness of a world absent the things of man. It is encompassing, enveloping. Not silence, but ambience. The sound of wind. The sound of water. Of boots crunching in snow and the harsh, rasping pop of a dying highway flare barely illuminating a dark, cold stairwell. The sound is story. It tells you so much about this world that it could almost be its own character. And when (always too close and always right behind you), you hear the wet, huffing bark of the wolf that has been following the smell of you across the ice until it could catch you in the middle of nothing, with nowhere to hide, sound is action, too. It is the cold, electric spike in the spine that lets you know the world is about to turn red, and something — the wolf or you — is going to die right now. As a game, The Long Dark is wildly imperfect. It is a survival simulator, leaving you to manage cold and calories and carrying weight in the early days of a non-specific apocalypse which has stripped the world (mostly) of its modernity. Cars sit abandoned where they stopped working. The lights are all off. Great Bear, the particular corner of the Canadian wilderness where you find yourself stranded, is hauntingly empty save for a few scattered survivors too old, too mean or too invested to move on. The spoken dialogue is excellent. The point-and-click text-only dialogue that happens outside of cut scenes is not. There is an unrealistic (and distracting) starvation mechanic that has me dying of hunger just a few hours after eating nine pounds of hot wolf meat. There are fetch quests that are tedious unless, in the middle of them, luck, personal idiocy and the game's own ticking, cruel algorithms throw up some combination of storm, injury, lack and danger that suddenly make them terrifyingly engaging. But still, I walk. As crashed bush pilot Will Mackenzie, I follow the thin trail left by Dr. Astrid Greenwood — vanished after the crash and likely come to harm. I meet an old woman and help her fill her refrigerator. I scavenge medicine for an old trapper in trade for wisdom and a gun. And all along the way, there is the sound of my pack creaking and the brilliant, painterly landscapes and the nagging, tantalizing, absolute understanding that The Long Dark is unfinished. That what has been released into the world are the first two chapters of a five-part tale and that no more of it is anything but a distant promise. It is incomplete. And that is what I love most about it. The mystery that operates at the core of The Long Dark is as simple as "what happened?" Sure, there's a girl to find, but I know I will not catch up with her. There's a mysterious dam, hints of violence, the remains of some eco-terrorist clubhouse far out in the pines. But as I sit, shaking, inside an abandoned mid-size family sedan, searching the glove compartment for granola bars and a new hat, none of that matters. Because the tangle of cars on the bridge tell their own tale. A note I found in the post office, a hidden cache of supplies under a rotting log. These are the incomplete stories of a broken and incomplete world, and they are far more compelling because they color the universe. They hint and scribble along the edges of the primary narrative and give it great, dark wings. There is a bewitchment to unfinished stories. And a freedom, too. Life is unfinished. It has no final boss-fight, no clean ending (until the last one). There is a bewitchment to unfinished stories. And a freedom, too. Life is unfinished. It has no final boss-fight, no clean ending (until the last one). It is packed with mystery and the scraps of other people's drama and allows you to walk where you will. You build an understanding of The Long Dark the way you do a new town or a new relationship — by looking sharp, by listening closely, by assembling hints and clues and building in your mind an armature of belief. So what happened? You can't really know. But as you crouch at the edge of a frozen lake, staring through the skirling snow at the smudge of vacation cabins clustered near the shore, you recall the sticky words of a note scratched on a piece of paper — the memories of a child grown up, of Great Bear before all...this. "Beentsy and I came up this way in the summers," it said. "When we were knock-kneed goofy kids. We fished and played with swords made out of sticks, wove leaky baskets from reeds. You could row across the lake. Those little cabins at the far end, where the tourists came and fished, hunted the deer and had their parties. We stood behind the counter and watched Dad welcome them, looked at the guest book and read the names. When the summer was nearing its end, and the cattails turned to fluff, we blew our wishes to the sky. Always to come back. Always." All those people are gone. Something drove them away. The same something that keeps you here now. So you stand, shoulder your pack and move quietly out onto the ice, listening for the crack, the howl of wolves. The cabins won't have answers. Nothing will. But there will be stories — incomplete, fragmentary, haunting — if you know how to look for them.